Nestling just below the peak of the hill with spectacular views of two of the island’s most beautiful beaches – Ffryes and Jolly Beach – you will find Dennis Cocktail Bar and Restaurant, popular with both tourists and locals alike. Dennis prides himself on providing a great time for his customers, combining unforgettable island hospitality with a delicious menu and friendly service. Chef Dennis Thomas says he learned everything he knows about cooking from his mom. As he grew up and mom was cooking on the coal pot, he was alongside with his butter tin following everything she did. On a Sunday morning, Dennis serves ‘Eva’s Breakfast’ in her honour. He also has ‘Arthur’s Catch of the Day’ named after his father, a fisherman. 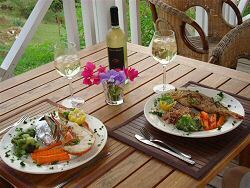 The menu is a great mix of local fare and international dishes. 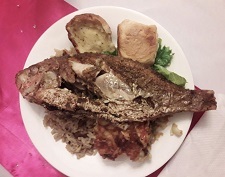 You can enjoy local dishes of chop-up; saltfish; curried goat and Johnny Cakes amongst others (there is always a local dish on the menu), plus grilled lobster; garlic shrimp; catch of the day; grilled chicken breast; island grilled steak and grilled pork chops. Dennis hosts a regular Pig Roast, drawing people from across the island but if you arrive a little late, don’t worry, there is always lobster; fish and chicken to enjoy! Of course it wouldn’t be complete without a well stocked bar! What a wonderful way to while away a few hours any day of the week! 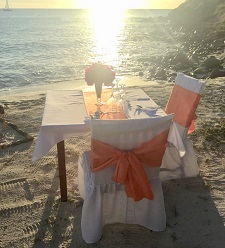 Dennis can also set up events on the beach from intimate engagement dinners for two to parties for large groups. At the top of the hill is ‘the White House’. Specifically designed for events which can host up to 150 seated guests and 200 dining guests, the White House is available for special events and weddings.